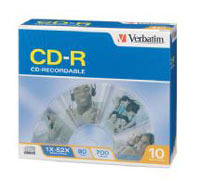 Use reliable, high quality CD-R discs made by a brand you can trust. Compatible for maximum 52x speed recording. Ideal surface for referencing using CD markers or labels.